Wizards of the Coast is building excitement for the launch of Magic 2014: Duels of the Planeswalkers with a new gameplay trailer that highlights the studio's flair for the dramatic and the addition of sealed play. For those of you uninitiated into Magic: The Gathering, the new Sealed Play mode is a huge addition. 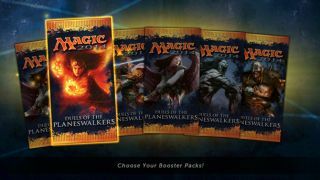 Players will open virtual booster packs and build decks from the 84 random cards that they receive. Sealed play was previously exclusive to real-life Magic and Magic: The Gathering Online and will give players a virtual way to experience the utter ecstasy that is opening a pack of cards—minus the new card smell. The Sealed Play mode will be the core of the new PvE experience with “a six-deck ladder where players take on mono-colored Sealed decks each corresponding with a particular Planeswalker, and finally facing a 'boss' Sealed deck.” Magic 2014 is also reintroducing the Slivers creature type, which rely on a hive mind to give them abilities that they share with other Slivers—they're the Zerg of Magic the Gathering. Magic 2014 will hit the PC, PSN, Xbox Live Arcade, iPad and Android tablets sometime this summer.